I just realized that Christmas is less than three weeks away and I've only just cast on for Brett's Christmas gift a few days ago. I am SO not going to finish in time. And you know what? I think I'm alright with that. Brett doesn't even care that the sweater won't be waiting for him under the tree on Christmas Day, he's just stoked that I'm even knitting him a sweater in the first place. The pressure to get it done is all on me. But you know what? I'm going to put that pressure into a bubble and just blow it away. A few days leading up to, and all weekend long I didn't feel so great. I was extremely sluggish and spent 99% of the time fighting my eyelids to stay open. For a while there I thought my week-long stint of staying up 'til the wee hours of the morning sewing my arse off finally caught up to me, hence the glacial speed I was moving at all weekend. I think I need to keep telling myself that I'm not as young as I used to be and that the days of pulling all-nighters are far, far behind me (not to mention that I no longer have the old school episodes of Saved by the Bell to keep me up, like it did back in university! This episode was by far the most favourite amongst us fashion girls. Hell, I still think about that scene when I'm under pressure and on a deadline!). I honestly thought maybe I was coming down with something. Yesterday I was sort of relieved when my endocrinologist told me that my TSH levels were pretty darn low and that my fatigued state was due to my thyroid acting up. Phew, it's nice to know exactly why I'm channeling the ways of a snail but boo erns that my thyroid is acting up again. So what I've really been meaning to say is that I did absolutely nothing all weekend. Nothing. Hell, I spent most of Saturday in my pyjamas! Brett had to go away for the weekend with his bosses to help out with one of their offices, so it was just me and the Munchkin holding down the fort. I had grand plans to get a crap load of stuff done and had a list of places to visit. Yeah...that didn't happen. To tell you the truth, we didn't really get to go anywhere either. Mainly cause someone didn't want to put on socks or their shoes ahemMunchkinahem and I was feeling way too exhausted to deal with that battle. Although, aside from his aversion to footwear and the occasional pair of pants, the Munchkin was actually really well-behaved all weekend and was content and at times thoroughly engrossed in playing with my hair clips and assorted kitchen tongs to help him pick up any toy that he could with them. Mainly little cars and his trains. Kids...such interesting little creatures, they are. Anyhoo, I feel like I totally wasted a weekend since I didn't sew or knit a stitch. I take great solace in the fact that before Brett took off I did get some sewing done. 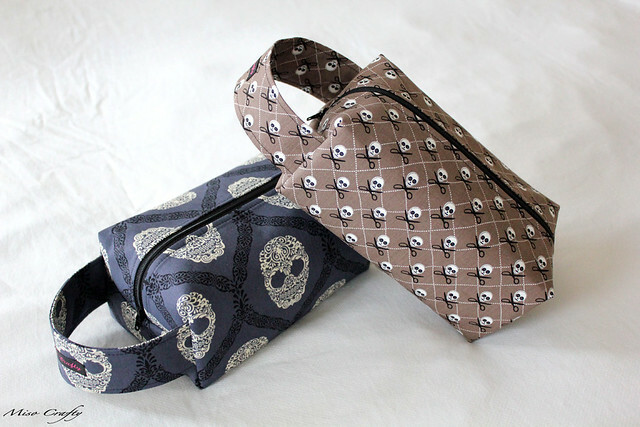 I finally dove into the stash of Crafty Pirates fabric that I had kicking around in my sewing closet, and was able to whip up the project bags that you see above. I almost didn't list them in my shop. I wanted to keep them for myself. But then I dug into the pile of Japanese imported prints that I have been dying to sew up. 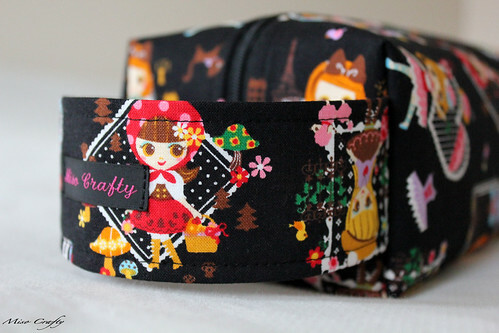 I made two of these "Pretty Girls" bags but only listed one. I'm trying to talk myself out of keeping the second one. So far I've managed to keep the bag in the sewing room, tucked behind another bag. Out of sight, out of mind, right?? Maybe I'll forget that it's even there. While I was digging around the stash I came up with some Christmas fabric that I had purchased a ton of last year with the (high) hope of sewing a bunch of drawstring bags to use in place of wrapping paper. Obviously that didn't happen. Hmm...maybe next year? 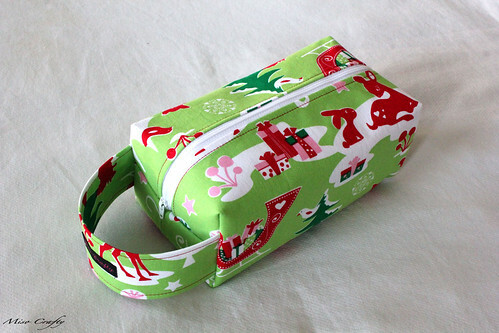 Instead I've used some of it to make a really cute and festive bag for holiday knitting projects. I guess I could make a bunch and put gifts into it. It would be way more work than simple drawstring bags. Oh, who am I kidding?? I'd make sure all those gifts would go to me so that I could keep the freakin' bags, regardless what kind they are. Does that make me a bad person? Shh...I don't want to know. Admit it. Secretly, you'd keep them too! These bags are going to have to suffice and quench my need to sew for at least a week...until I can feel somewhat "normal" again. Please note that this post took me a few hours to write cause I kept dozing off. Hmm...maybe I'm narcoleptic and not a sufferer of Graves' Disease? Does this post even make sense?? I'll put it on record right now: I'm sorry if anyone got messages or emails from me over the weekend that either didn't make sense or was just one long run-on sentence. Or something that resembled a drunk phone call, but in email form. I was not of right mind. Luckily Brett is back and I've been able to take naps here and there without worrying about the Munchkin not being supervised (although, the worse he's ever done is spill an entire box of cereal on the floor in an attempt to open the bag...oh wait, I forgot about the time he used a blue ink pen to scribble all over a leather handbag...grrr). I finally got around to taking some photos of some knitting FOs that I can't wait to share, and I promise that I'll share them in the next few days. I've decided to take this week off from sewing and concentrate on knitting. I'm hoping my energy will return and I can get mucho knitting accomplished. For now, I'm going to go back to bed and sleep for a few more hours. I am so sorry if this post is pure crap. Ok Scottie. Beam me up. Thanks Natalie for making feel sane...and for caring! :D I will get some sleep. Tomorrow. I swear!